Once your wedding date has been finalised, the very first thing you do is start scouting for the perfect bridal lehenga to wear on your big day. While you must already have a vision of what your dream wedding lehenga should look like, here are the latest lehenga designs 2018 that you can pin to your wedding board on Pinterest for inspiration. Here, I have curated a list of top lehenga designs 2018 that took my breath away with their sheer beauty. Scroll down and choose the best lehenga design according to your style and taste. One of the latest lehenga designs 2018, the multicolour lehenga is sweeping all the brides off their feet. The mix of different colours with sequins and embroidery make for a fantastic bridal lehenga. If you are looking for a lightweight bridal lehenga, then finalising on a traditional Banarasi lehenga seems like a good choice. Banarasi lehenga designs 2018 are a hot and running fad among brides these days. 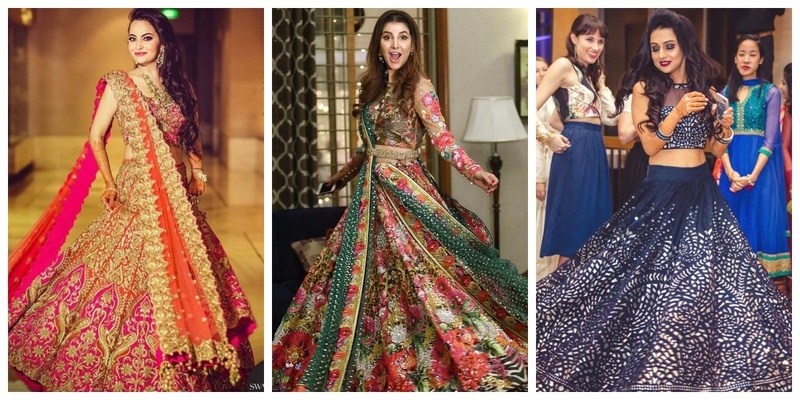 If this is the style you want to wear on your D-day, then do check out this list of best Banarasi lehenga designs worn by real brides! A break from the classic red bridal lehenga, this orange bridal lehenga has gorgeous gota patti work in silver that gives it a heavy bridal look. Definitely one of the best and latest lehenga design 2018. This black lehenga is for brides who don’t stick to norms and break the barriers. With heavy multi-colour embroidery, this bridal lehenga is easily the most offbeat lehenga design of 2018. A classic combo of orange and pink, this bridal lehenga 2018 has beautiful golden embroidery that makes it look bright and peppy! A bright, sunshine yellow is always a good idea for a bridal lehenga design. This yellow one right here is one of the latest lehenga designs 2018 that has beautiful embroidery along with dupatta that completes the look! An all-gold bridal lehenga is one of the latest bridal lehenga trends of 2018. While some might think that it looks too sparkly, believe me, it doesn’t. Plus, you are the bride; you are supposed to shine like a goddess on your big day wearing the best lehenga design that is out there in the market. If you are the kind of bride who would like to stick to red while selecting her bridal lehenga, then this lehenga design 2018 with gold sequined work all over and a red net dupatta is just perfect for you! A royal and enchanting colour, emerald green looks amazing on bridal lehenga designs, especially if they have lovely golden embroidery like this one. Pick this latest bridal lehenga design 2018 if you are okay to venture out and try other colours apart from red and pink. One of the latest lehenga designs in 2018, the blue colour is taking the new-age brides by storm. The intricate embroidery and work on these blue lehengas make them a sight to behold. Check out all the real brides we spotted wearing a blue lehenga here! This lehenga design 2018 is one of the newest and most contemporary styles seen on a real bride. The elegant peach colour with beautiful embellishments and a cape style choli make it the perfect choice to wear for your cocktail party or reception. Purple lehengas are one of the latest lehenga designs 2018 for wedding. The different shades of purple along with detailed embroidery and embellishments make it a great option to wear on any of your wedding functions. One of the most classic and best lehenga designs of all time, this maroon and gold embroidery lehenga is for the traditional bride. The heavy zardosi work on a velvet maroon lehenga is a classic bridal option for those who want to opt for something that’s eternally beautiful. These red bridal lehenga designs 2018 are a classic example of bridal wear that has a timeless beauty. The combination of gold embroidery on a bright red lehenga is something that most Indian brides prefer to wear on their wedding day. Check out all the latest bridal lehenga designs 2018 in red here! White is an unconventional colour for an Indian bride to wear on a wedding day. But if you want to stand out in the sea of pinks and reds, a white lehenga embellished with gold, silver or multi-colour threads is a great option. Don’t these real brides look absolutely stunning wearing these white lehenga designs 2018? Chrome applique lehengas are one of the latest lehenga designs 2018. They are usually designed on bright colours and have lovely chrome or silver appliques that look like mirror work. These lightweight bridal lehengas are perfect for brides who don’t want to carry a heavy lehenga all day. Check out more chrome applique lehenga designs for inspiration here! Net lehenga is one of the best lehenga designs when it comes to light and airy lehengas. Look at this chirpy bride carrying this baby pink net lehenga with gold hearts and embroidery like a complete boss! One of the latest lehenga designs of 2018, these pretty ones with drape sleeves add lots of drama to your wedding outfit. Choose a pastel shade with minimal embroidery and long flowy sleeves to get a dreamy princess kind of look on your big day. Paired with a beautiful and flowy lehenga is a cape choli, which gives the traditional bridal lehenga a fun and modern twist. These types of bridal lehengas are ideal to wear for other wedding functions like sangeet or mehendi. A trending lehenga design of 2018, the peplum choli and flared lehenga combo work well together and give a modern and edgy look to your bridal ensemble. Which of these latest bridal lehenga design 2018 are you planning to finalise for your big day?